At the heart of the Medicare for All proposals championed by Sen. Bernie Sanders and many Democrats is a revolutionary idea: Abolish private health insurance. Proponents want to sweep away our complex, confusing, profit-driven mess of a health care system and start fresh with a single government-run insurer that would cover everyone. But doing away with an entire industry would also be profoundly disruptive. The private health insurance business employs at least a half a million people, covers about 250 million Americans, and generates roughly $1 trillion in revenues. Its companies’ stocks are a staple of the mutual funds that make up millions of Americans’ retirement savings. Such a change would shake the entire health care system, which makes up a fifth of the U.S. economy, as hospitals, doctors, nursing homes and pharmaceutical companies would have to adapt to a new set of rules. Most Americans would have a new insurer — the federal government — and many would find the health insurance stocks in their retirement portfolios much less valuable. “There’s no precedent in American history that compares to this,” he said. Economists have begun wrestling with basic questions about what this sort of change would mean and disagreeing over whether it would cost more or less than the country’s current health care system. No one has examined the full economic impact of such plans on jobs, wages, investors, doctors and hospitals — or the health insurance companies themselves. Such an undertaking would be difficult, given the vagueness of key parts of the proposals being discussed and the wide-ranging possible effects. There are few international analogues to the Medicare for All proposals, but Canada, which provides similar doctor and hospital benefits for its residents, probably comes closest. Even there, people buy private insurance for benefits that are not covered by the government program, like prescription drugs and dental care. Most other countries with single-payer systems allow a more expansive, competing role for private coverage. In Britain, for example, everyone is covered by a public system, but people can pay extra for insurance that gives them access to private doctors. Most countries in Europe don’t have single-payer systems, but instead allow private insurance companies to compete under extremely tight regulations. Legislators writing the bills acknowledge that people in the health insurance industry would lose their jobs. Proposals in the House and Senate would set aside large funds to help cushion the blow to displaced workers, offering them training, benefits, and income supports. The health insurance industry is now composed of a mix of for-profit and nonprofit companies of various sizes. About 155 million Americans get private health coverage through an employer, but the reach of the industry extends into publicly funded insurance programs. A third of Americans enrolled in Medicare, which insures older and disabled people, and four-fifths of those in Medicaid, which covers the poor and disabled, now get their benefits from a private insurer. Simply talk of Medicare for All makes investors jittery. 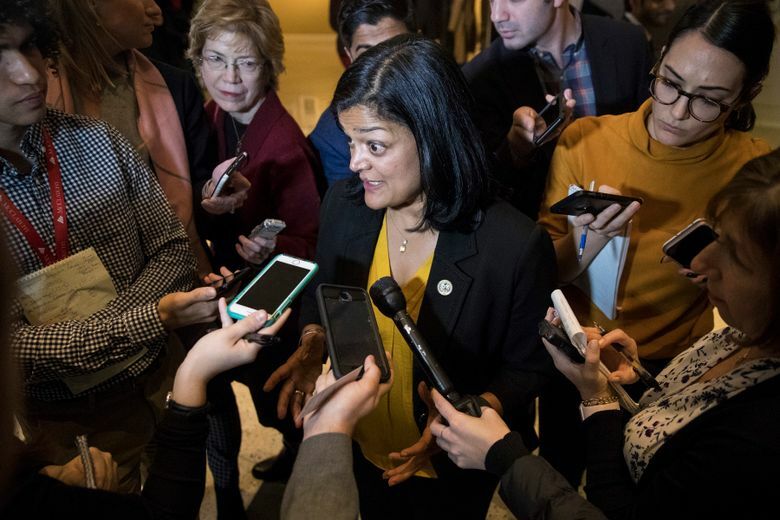 Shares of the large publicly held insurance companies, including Cigna, Humana and UnitedHealth, fell when Rep. Pramila Jayapal, D-Wash., introduced her bill in late February, but have largely rebounded. The effective takeover of the health insurance industry in the United States would mean a huge hit to the companies’ stocks, although the companies, which have additional lines of business, would most likely survive. While the bills would give relief to insurance industry workers, they would provide no such compensation for investors. Not surprisingly, the insurance industry and many other health care industries vociferously oppose these plans and plan to spend heavily in fighting them. Many supporters of this approach see elimination of private insurance as a key feature, not a bug, meant to improve the program’s efficiency and equity by streamlining the health care system and weakening profit motives. With a single insurer covering every patient, hospitals and doctors could spend less time and money complying with differing policies, negotiating contracts, and filing forms to get paid. This idea — once at the edge of Democratic politics — has moved to the mainstream of the debate among the party’s numerous presidential contenders. Sanders, I-Vt., ran on the idea in his 2016 campaign, and now five 2020 Democratic aspirants have co-sponsored one of the two Medicare for All bills. Sens. Cory Booker of New Jersey, Kirsten Gillibrand of New York, Kamala Harris of California, and Elizabeth Warren of Massachusetts co-sponsored Sanders’ bill in the last Congress. Rep. Tulsi Gabbard of Hawaii is a co-sponsor on this year’s House Medicare for All Act. The concept, in broad strokes, appeals to many Democratic voters. But overall support diminishes by a third or more when people are told that the plan would involve eliminating private insurance, raising taxes, or requiring waits to obtain medical care, according to surveys from the Kaiser Family Foundation. And the approach is a big departure from the Democrats’ strategy in 2010, when Congress passed the Affordable Care Act. That law expanded coverage, but did so largely using private insurance carriers. It set up marketplaces for Americans who didn’t have coverage through work to buy insurance, usually with federal subsidies, and broadened access to the Medicaid program for the poor. Obamacare was designed to build on the current system, patching its holes while minimizing disruption and avoiding the fierce opposition from industry that helped sink earlier attempts to change the health care system. But 107 Democratic House members are now co-sponsoring a Medicare for All bill written by Jayapal. Sanders, whose update of his bill is expected in the next few weeks, argues that only a single-payer approach would resolve problems he sees as inherent in private insurance. Both proposals are clear that a single, government-run insurer would replace the private sector, but they are less detailed about exactly how the government program would pay for medical care. Their plans would include nearly every doctor and hospital in the United States and provide generous benefits, including dental care and hearing aids, and would not require patients to pay any out-of-pocket cost to see a doctor. The federal government, of course, would have to cover those benefits, and would need to raise taxes to pay for them. Gerald Friedman, a labor economist at the University of Massachusetts Amherst, who was close to Sanders’ 2016 campaign, estimated then that it could reduce the nation’s health care spending by $6 trillion over a decade, while the left-leaning Urban Institute said it might increase the overall bill by nearly $7 trillion. Both Sanders and Jayapal said the switch to a government insurer would mean no loss in access to health care that private insurance provides. There are sharp disagreements among Democrats in Congress over whether Medicare for All or a more incremental approach is best — and presidential candidates co-sponsoring Sanders’ bill also support other, less sweeping measures. Harris, asked directly about getting rid of private health insurance during a CNN forum in January, answered, “Let’s eliminate all that. Let’s move on.” But after her comments were characterized as extreme, her campaign quickly clarified that, while she continued to endorse the Sanders plan, she would also support more incremental expansions of health coverage. Dr. David Blumenthal, a former Obama administration official who is now chief executive of the Commonwealth Fund, a nonprofit that funds health care research, voiced concern about the prospects for the most transformative approach. “I do think it’s an uphill battle to take things away from people in the name of giving them something better,” he said. Believers in markets argue that consumer choice and competition among private health plans improve the quality of care. Others laud private industry’s relative nimbleness compared with Medicare, which can be bureaucratic and prone to political influence. In a Medicare-for-All world, private insurers might evolve into contractors for the big government system. They already perform various functions for Medicare, including helping the program manage paying its bills. The industry could retain that role, or take on new responsibilities.